In an interview edition of show, Blake sits down with two special guests. First up will be Frankie DeFalco from Brew City Wrestling to hype up the Wisconsin State Fair on Thursday morning. Then Kevin Eastman, the co-creator of the Teenage Mutant Ninja Turtles to discuss his new kickstarter campaign Drawing Blood that launches on August 1st at www.kevineastmanstudios.com. It's a good and different show so enjoy! After Sal's laptop crashed and with Kyle in studio, the guys have a fun fast paced show. Throughout the show, Blake gushes about the Mike & The Mad Dog 30 for 30, Kyle and him discuss Spider-Man Homecoming spoiler free, Sal praises Big Brother. 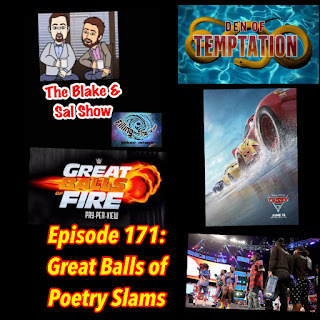 The discussion turns to Kurt Angle and Jason Jordan, some loaded news and then after Kim jumps on for a special interview, they preview WWE Battleground and Blake tells his feelings about the Punjabi Prison match. Finally the three of them break down the news and notes from the D23 Expo. Sal is not a fan of some Disney's scheduling choices, Blake is angry that he cares about a movie that he shouldn't and everyone is a bit iffy about very news stories. Sit back and enjoy the show! 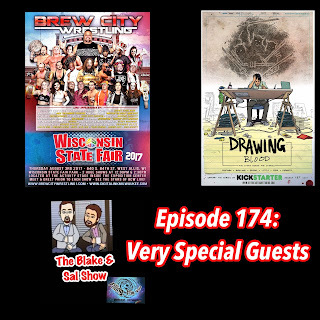 Join Blake LIVE at the Wisconsin State Fair for the Brew City Wrestling Preshow on August 3rd at 11am CT/12pm ET! Blake brings on the boss David to discuss their history with New York radio after the Mike & Mad Dog 30 for 30 last night. The convo turns into an origin story about how the guys got into talk radio and how they found the passion in podcasting. It's a fun listen. Somewhow 2017 wrestling includes a man getting throw into a pool, Japanse wrestlers in Cali, a Jerry Lewis song, an owl, a flag match and a live rap battle. The guys discuss how that sentence makes sense as well as the crazy start of Big Brother, how the Devils stole Marcus Johnasson from the Washington Capitals, ridiculous contracts and even rant one last time about Ilya Kovalchuck.